A cross-country rider from Valemont, B.C. has proven hat-tricks will be the talk of the town even beyond the race for the Triple Crown of Slopestyle this year at Crankworx Whistler. 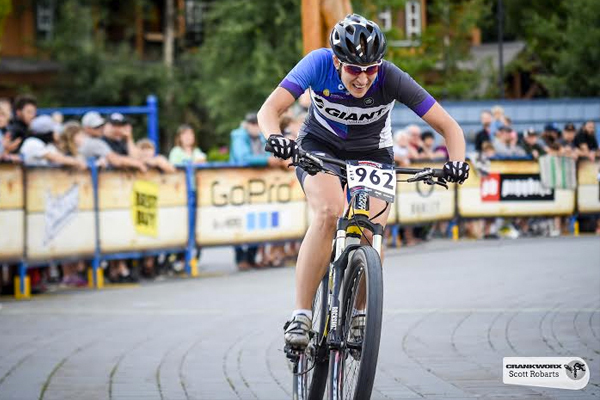 Jean Ann Berkenpas took home both $50 preems and another $100 before flying, full-throttle, through the finish line in the Fat Tire Crit, handily securing the first official win of Crankworx Whistler 2015. “I feel like I have a good thing going, so I’ll try to keep it going as long as I can, I guess,” said Berkenpass, who is also racing the Canada Cup X-Country next Friday. A self-declared sprinter, Berkenpas said she always sees better results on short-track, elimination-style events and her results prove her case. She has now entered the Fat Tire Crit four times, winning the last three. By contrast, the mens winner, Quinn Moberg, of Squamish, B.C., earned his first turn at the top of the podium, giving up every preem lap to Craig Richey, of Smithers, B.C., and Victoria’s Cody Canning, who alternated the lead until the last lap. “I just waited for the final and sprinted for the win,” said Moberg, who was forced to pull out of his first attempt at the race, last year, when his foot came out of his pedal. The Fat Tire Crit is an elimination-style race which sees the men race for 20 minutes, using mountain bikes to challenge a road-style, concrete circuit. After the 20 minutes, the riders have five preem laps to try and pull away from the pack for the win. The women’s race runs the same, with riders eliminated on certain runs to home the field to a final few, though the women race for 15 minutes before the final five-lap sprint. The Fat Tire Crit was the first official adult competition of the Crankworx World Tour’s return home. 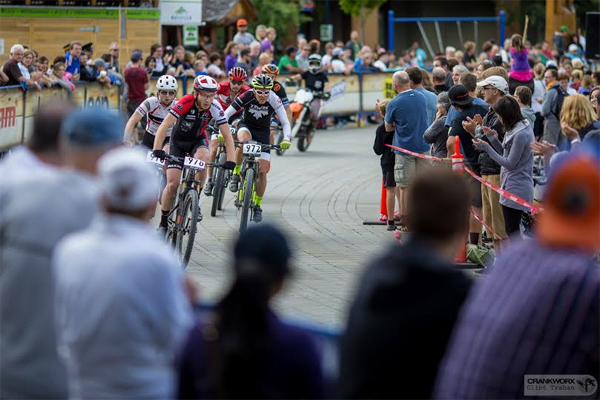 Now back in Whistler, mountain bikers can look forward to 10 solid days of racing, competitions and culture, with a huge focus on the second year of children’s events. The Kidsworx Village Crit saw 125 children sign up to race and a 7 to 9-year-old field so packed the 41 young races had to jostle for position to secure a toehold near the line. The youngest rider of the afternoon, Devan Paris, beat 20 other kids to secure first spot in the run bike race, while Charlie Henderson bested all others in that packed 7-9 year old category. The oldest Kidsworx criterium racers were born the year Crankworx came into the world some dozen years ago and Damian Georgyev proved the top racer in that category this final 10 to 12-year-old Kidsworx category. Through dirt, sweat and cheers, Crankworx celebrates the epic endurance, supreme flow, monster air and heart-stopping drops of gravity mountain biking. Anointed by dirt, powered by passion, the Crankworx World Tour travels to Rotorua, New Zealand, Les Deux Alpes, France and culminates in its Canadian home base of Whistler, B.C.